With the word spreading that only 10,000 units of the ASUS Eee Pad Transformer were shipped in April, a heavy supply-demand inbalance in favor of the latter is creating a shortage of the tablet. Company spokesman David Chang said that with 100,000 units expected to ship this month and 200,000 in June, the shortage would be "significantly alleviated" next month. 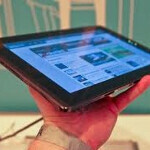 Chang said that demand is "by far" outpacing sales estimates of the tablet. U.S. distributors are not sure about that claim because they have received such a small amount of the device that demand can not be accurately gauged. The 300,000 Eee Pad Transformer units sold would give ASUS a victory over the heavily advertised Motorola XOOM. The latter sold only 250,000 tablets during the Winter as we reported, which means depending on how it did in the Spring, the ASUS tablet could be the best selling Honeycomb flavored device in the marketplace. At $400, the 16GB ASUS Eee Pad Transformer is priced $200 less than the Motorola XOOM's 32GB Wi-Fi only version and $100 under the price of the 16GB Apple iPad2 which explains some of the reason why demand for the device has been outstripping supply. They need to make sure they have ample keyboard / battery docks. That's why I sold my Xoom and still can't get my hands on this one...yet. if its half the quality of their computer parts.. we are safe.. with room to spare. I am laughing as I read this article and see the Xoom ad on the side that states "It is everything a tablet should be", except for affordable! Go ASUS. why would u want a 3g version? It would be more expencive and then u get a contracted plan with it too. give me wifi, let me use my lovely android to get some free 4g wifi tethering, and i got all i need.